One of the entrances to God’s Acre in Old Salem. Yesterday my wife, daughter and I took one of our trips to Old Salem, located in Winston-Salem. 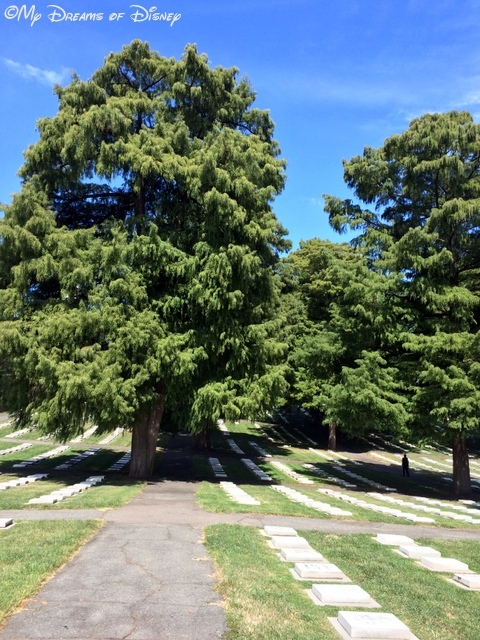 One of my favorite parts about Old Salem is the incredible beauty that exists at God’s Acre, which is the Moravian Cemetery that is used to this day for burying those that have been called home. 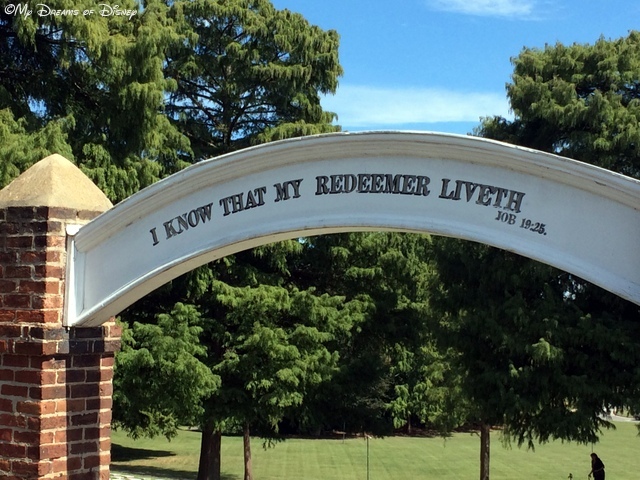 The Bible verse at the entrance to the cemetery says it all, in my opinion. If those words don’t speak hope, especially when you, as a family, are grieving the loss of a loved one, then I don’t know what words will. In case you didn’t know it, God’s Acre is divided out by choir. Men are buried in one area, women in another, and children in another. There is more of a breakdown than that, but I don’t remember them all exactly. All of the tombstones are the same design. The tombstone of a wealthy member is the same as the one of a poor member — there is nothing distinguishing them in any way to be different in their stature — they are equal in the eyes of the church. Yesterday was an absolutely gorgeous fall day. A light breeze was blowing, the sky was a brilliant blue, and the sun was shining. It also happened to be the day that George Hamilton IV was laid to rest at the cemetery. Our thoughts and prayers go out to his family and friends. A view of God’s Acre. My friend Nancy has an update on her Mom — give Praise to God!Thank you for prayers my friends ! Mommy is home resting comfortably. Scar tissue from surgeries are causing the pain. Blood work and ct scan showed she’s healthy as a momma bear. Thank you Lord !!! Hodges Blythe needs prayer for her husband Dale who is suffering from heart problems. touch our men Lord and heal them. if it will be your will Lord let us spend many more years together with our husbands.thanksLord, please be with Milton and Joyce — comfort them, heal them, take away their stress, their fear, their worry. Please grant them many more days together. In Your Name we pray. Amen. A reminder from my sister-in-law Sandy. Thanks Sandy for sharing via Facebook:God has laid up spiritual blessings for us in his Son the Lord Jesus; but requires us to draw them out and fetch them in by prayer. Even the best Christians need to be prayed for: and while we hear of the welfare of Christian friends, we should pray for them. Even true believers greatly want heavenly wisdom. Are not the best of us unwilling to come under God’s yoke, though there is no other way to find rest for the soul? Do we not for a little pleasure often part with our peace? And if we dispute less, and prayed more with and for each other, we should daily see more and more what is the hope of our calling, and the riches of the Divine glory in this inheritance. My friend Chris shares urgent prayer requests for a young man named Hudson. Here is what he wrote on Facebook today, 9/21:HUDSON FOUND A HEART!! Surgery is tonight. Please pray throughout the night for the Drs, nurses, Hudson, his family and the family who lost their baby.Please pray for all involved. God’s Will will see this through, but our prayers will help also! Thanks everyone! Then, a followup post: Hudson is off bypass, heart is beating on its own. God is Good! Please pray for the family of David Swisher, a former co-worker of my wife Cindy. David passed away very recently unexpectedly. Please pray for God’s Peace, Comfort, Strength, and Love to descend upon David’s family, and please pray for his salvation, as we don’t know if he knew Jesus. His family has a tough road ahead, so please keep them in your prayers for a while.Thanks, everyone. My friend Rebecca has a prayer request. Here is what she wrote on Facebook:I talked with my parents last night & was told that my father has a brain tumor. He seemed in good spirits & assured me it’s nothing to worry about. Dad is seeing the surgeons on Tuesday to find out what exactly the procedure entails & to schedule it. Please keep my dad in your prayers for an easy procedure, a quick recovery, & good health. Thank you.Please pray healing prayers for her dad, and prayers for Peace, Comfort, Strength, and Love for all of the family. Thanks everyone! Lead us not into temptation, but deliver us from evil. For thine is the Kingdom, and the Power, and the Glory forever and ever.